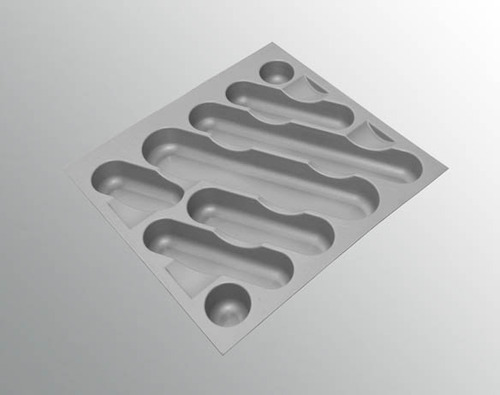 We provide to our customers a high range of PVC Cutlery Tray to the market. These products are manufactured by our professionals using the supreme quality raw material and advanced technology in line with industry set standards. In addition, our provided products are available in diverse technical specifications. Furthermore, we offer these products at reasonably rate. Year of Establishment 1996, M/s. Ranjan Khosla & Sons Pvt. Ltd. has gained an admirable position in Manufacturing, Supplying, Importing and Wholesaling of Pantry Units, Roller Shutters, Pull-Down Units, Corner Solution, Latent Condiment Box, Waste Bins, Skirting, Stainless Steel Shutter, Cutlery Tray's and Boxes etc. Our offered products are manufactured using the optimum quality raw material that is sourced from reliable vendors of market. In addition, in order to offer the best quality of products to clients, we also check these products on dissimilar quality parameters using sophisticated techniques. Furthermore, we follow universal industry standards in the engineering of our products. These products are extremely admired in the industry due to their, effortless operations, rust resistance, longer operational life, effective performance, low maintenance and reasonable prices.